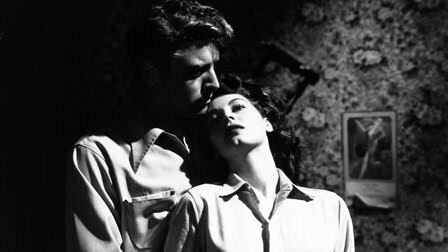 Film Noir does not get more hard boiled, tough and pulpy then Robert Siodmak’s original 1946 ‘The Killers’. Of course, it’s also based on a story by Ernest Hemingway whose mere presence lends it the tough street cred, but apparently his name above the title actually overstates his connection to the story and the film. The opening scene, which is Hemingway’s more than anything else in the film, is a stunner. In fact, it’s so good, it feels like a set piece lifted from another film. Two hitmen wearing overcoats and black hats walk into a small diner with ice cold attitude to spare. After bullying around the two occupants they reveal they’re here to do a hit job on someone called ‘The Swede’. Their banter is some of the sharpest hard boiled noir dialogue ever written. It’s so cold and ruthless it feels like a parody of crime dialogue. Soon we learn The Swede is Ole Anderson (Burt Lancaster’s first starring role), an ex-boxer and small time hood, and is indeed killed, but who dies without a fight as if accepting his fate as some kind of penance. We learn his insurance policy lists an unrelated old woman, a near stranger, whom he boarded with once years ago as his benefactor. Enter crack insurance agent Jim Reardon (Edmund O’Brien) who seeks to trace back Ole’s life and find the secrets behind his mysterious death. Writer Anthony Veiller (with some uncredited help from John Huston and Richard Brooks), does a Sunset Boulevard/Citizen Kane/Double Indemnity track back, bringing Reardon to the doorsteps of the influential people and events in his life. At the centre are a femme fatale dame Kitty Collins (Ava Gardner) and a burglary job with a number of double-crosses in between. The caper anchors the film and is choreographed cinematically with the kind of distinct expressionistic technique we wouldn’t see until some of the great French crime films of the 50’s. The plotting scene is marvellous seedy, a shadowy poker game with boxing ring hoodlums, cigarette smoke creating ominous clouds adding textures to the scene. Ava Gardner, who forms a love triangle between the Swede and one of the thieves, is at her comely best. Just watch her posture as she watches the card game on the bed, dressed in a demure sweater. This is sexual napalm! Siodmark who earned his stripes directing in Germany during the Lang/Murnau Expressionist days creates striking compositions. Elwood Bredell’s lighting nearly writes the book on the noir look. Long shadowsand harsh contrasty lighting dominate the frame. Swede’s funeral scene for instance, though filmed in an interior uses the studio control to create luscious and rich gothic cloudscape overhead. Bredell even uses Toland-style deep focus photography, low camera angles, dramatic camera moves, and long takes. The film's technical high point is the hat store robbery scene which is executed in one single unedited shot. And lastly I can’t go on without mentioning Miklós Rózsa’s hard driving, an angry and violent pulsating rhythm as tough and brutal as anything else in the film. “The Killers” is a must see. Just saw that my college library has it so I will definitely check it out. Have you seen the '64 version? I think i read that Reagan is in it. No haven't seen the 64 version, but it's Don Siegel, so it's worth a look. The criterion version has both films together. What a wonderful review of a wonderful film. Yeah, this certainly ranks as one of the greatest film noirs; hell, this would rank among the greatest films ever made. The opening scene, as you have marvelously brought forth, indeed happens to be a set piece like few others. The icy cold dialogues don't just cut through the other characters present in the diner as well as the viewers, they form the perfect springboard for what follows as it sets the tone for film. The staccato dialogues and the nihilism of the script play major roles there. Burt Lancaster is really good. But the movie fairly and squarely belongs to Ava Gardener, the most alluring and lethal femme fatales that I have watched, albeit at 24 frames-per-second.